For most people, St Kilda is remote and mysterious, a windswept outcrop in the North Atlantic which against all odds supported human habitation for more than 4,000 years. But for Norman John Gillies, the last survivor of its tiny population, a new edition of a black-and-white film offers a glimpse of a lost way of life that was once familiar to him. Britain’s Loneliest Isle was shot in summer, 1928, two years before St Kilda island was evacuated. This unique 16-minute documentary has been incorporated in The Island Tapes, a DVD which mixes archive footage with music in an evocation of Hebridean life. When the original film was made, the islanders still clung to the hope that St Kilda – cut off from the Scottish mainland for nine months a year - had a viable future, eked from their few cattle, and the woollen goods the islanders made. Most movingly, for Mr Gillies, 82, it includes footage of his own mother at a spinning wheel, her shawl wrapped around her head against the fierce wind. Mary Gillies’s death, in February 1930, would be the catalyst for the departure of the last 36 inhabitants. 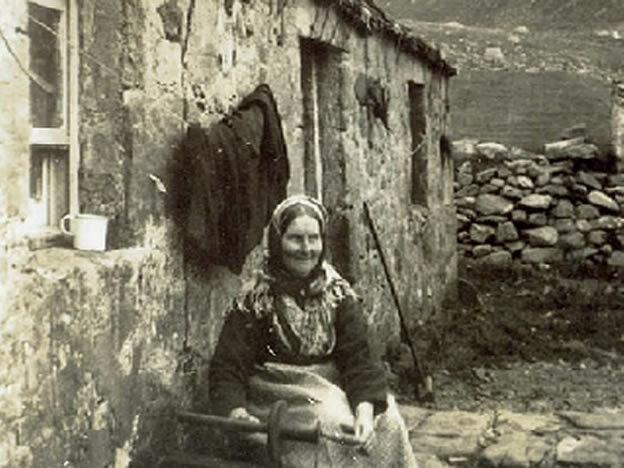 She fell ill while she was pregnant but storms prevented her leaving for a few days, and by the time she was finally taken from St Kilda her fate was sealed. She and her baby daughter died at Glasgow’s Stobhill hospital. “I remember that well, as if it happened yesterday. Me standing down at the seashore and waving to her as she was rowed out in a boat with her shawl on and her waving back,” said Mr Gillies, who has lived with his wife in a village near Ipswich for the last 60 years. His mother’s death had far-reaching consequences for the islanders. “They realised that they were in a hopeless position if anybody took really ill. That was one of the things. All households had to sign that they would leave St Kilda. That happened on 29 August, 1930,” said Mr Gillies. Though only five when the island was evacuated, the last St Kildan still has evocative memories. “I can remember when I used to go into the church with my parents and how I used to be carried by my grandmother on her back when she went milking in the glen. One of my most treasured memories is of my mother calling me home to dinner, when I was playing at one end of the island or the other,” he said. Mr Gillies left Morvern to join the Royal Navy in 1943, serving on torpedo boats which were based at Felixstowe. One Sunday, he accepted the invitation of a Free Church minister to attend a service in a nearby village. It was there he met his wife, Ivy: "That’s how I came to settle here, a St Kildan in Suffolk." In the film a series of images show women with weather-beaten faces staring into the camera, children hiding behind a rowing boat and men plucking sea birds from the cliffs to eat. The original silent movie is scripted through a series of cards which adopt an ever more patronising tone as the Glaswegian filmmakers take in the realities of St Kildan life. In one sequence after a make shift picture house is installed in one of the cottages the film describes the villager’s reactions. “We showed the St Kildans their first moving pictures”, “The show was free, but the girls were shy”, “The machine puzzled them”. After they left, many of the islanders settled near Lochaline, Morvern. “It was very hard and difficult for the older people. St Kilda had been their way of life. They’d found it hard – but everyone had to knuckle down and get on with it,” said Mr Gillies. Rare archive material from the remote islands of St Kilda forms part of a new DVD to be launched at Scotland's premier winter music festival, Celtic Connections, in Glasgow next week. The Island Tapes DVD features five silent films from the Scottish Screen archive, recording life on St Kilda, Harris, Skye, Orkney and Shetland in the 1920s and 1930s. It also features a sixth film following the emigrants' trail in a 1936 voyage from Glasgow to New York. The films are set to original music by guitarist David Allison, accompanied by musicians Ian Melrose, Allan Neave and singer Alyth McCormack. Until now, the films have been screened only as backdrops to live performances of the music. One man with an interest in the St Kilda section of the DVD is Norman John Gillies, 82, the last survivor of the 36 residents who were evacuated from the archipelago in 1930. His mother can be seen at her spinning wheel during a documentary, Britain's Loneliest Isle, made in 1928. Poignantly, she went on to die of complications in pregnancy after storms prevented her leaving the island to seek medical treatment. Mr Gillies, who lives at Ipswich, said: "I remember it well, as if it happened yesterday. Me standing down at the sea-shore, waving to her as she was rowed out in a boat." Her death was the final catalyst which persuaded reluctant islanders that it was in their best interests to leave St Kilda forever. There followed the sight of islanders standing at the stern taking them from their homeland forever, waving until the isles could be seen no more. Mr Gillies said: "They realised they were in a hopeless position if anybody took really ill. All households had to sign that they would leave St Kilda." Mr Gillies - five when he left St Kilda - said: "I can remember when I used to go into the church with my parents, and how I used to be carried by my grandmother on her back when she went milking in the glen." Island Tapes has been performed in the UK, US, Germany, Estonia, and France, and at film festivals in Tallinn in Estonia, Inverness, and on Ellis Island in New York. A few flickering pictures on a 16-minute documentary link Norman John Gillies, 82, with a life which had its origins in prehistoric times. The woman at the spinning wheel, shawl wrapped round her head to protect her from the biting winds is his mother. The young woman Mr Gillies is gazing at fell pregnant two years after the film was made, but the storms that always batter St Kilda prevented her from reaching the mainland for several days. By the time she got to hospital in Glasgow, it was too late – she and her baby daughter died. The death of May Gillies, in February, 1930, finally persuaded the 36 remaining residents of St Kilda, 41 miles west of Benbecula in the Outer Hebrides, they would have to leave the island to survive. After 4,000 years of habitation since the Bronze Age, the outcrop was evacuated, and, at just five, Mr Gillies left for Morven, in Argyll. This last survivor of St Kilda, who has spent the last 60 years with his wife in a Suffolk village, still has vivid memories of the primitive Atlantic colony. Now the documentary featuring his mother, Britain's Loneliest Isle, has been incorporated in The Island Tapes, a DVD that mixes archive footage with music to offer a glimpse of gritty Hebridean life. But Mr Gillies needs no visual aids to recall the day when he last saw his mother: "I remember it as if it happened yesterday, " he said. "Me standing down at the shore and waving to her as she was rowed out." 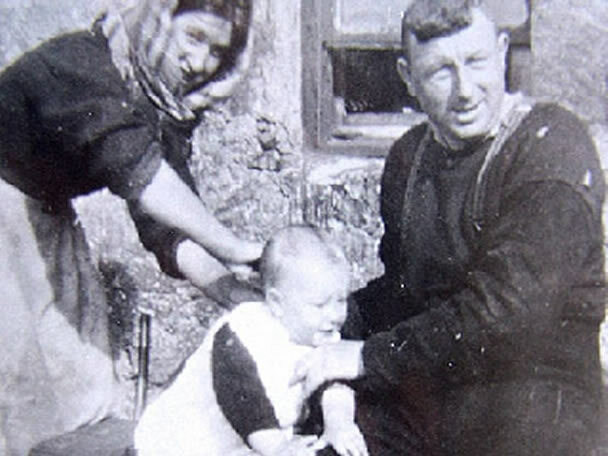 The death of Mary Gillies brought home to the St Kildans the hopelessness of life in unforgiving conditions while the people on the mainland were taking advantage of the 20th century: "They realised they were in a hopeless position if anybody took really ill, " said Mr Gillies. "I recall some of the older ones at the rear of HMS Harebell, which took us off. They waved to the land until it was out of sight." The islanders left for the new homes in August, 1930, among them the island nurse and the missionary and his small family. The islanders' sheep were placed in small boats and towed out to the SS Dunara Castle in the bay. The island's six cows had to swim out from the jetty, dragged by a small boat. Mr Gillies left Morven to join the Royal Navy in 1943, serving on torpedo boats based at Felixstowe and it was there he met his wife, Ivy. "That how Icame to settle in Suffolk, " he said. Of the St Kildans who settled in Argyll he said: "They found it hard, but everyone had to knuckle down."